Putting together a corporate event can be, shall we say… a little bit sluggish. All you want to do is please everyone, but it never seems to work out…. For 10 years Thames Rockets have specialised in the solution to the best team activities in London and corporate events in the work calendar. From the interns to the CEO we can guarantee complete satisfaction from the minute they don their super warm waterproofs (if they need them!) to the minute they wave goodbye. Your satisfaction is our priority, and we deliver top quality team activities each and every time. We will look after you every step of the way, with our experienced bookings team guiding you through the planning process from conversation to confirmation! However, we’re not the heroes here. We’ll leave that accolade for you when your team thank you for arranging the best company treat in history! There’s entertainment all the way with our superb comic guides on-board to keep the banter in check, and thrills and spills with our highly experienced skippers revved up and ready to take you and your team for a spin, twisting and turning all the way. Perfect for visiting colleagues flying through, to London city workers – Thames Rockets really do provide something for everyone. We can even help with the next part of your corporate event as we work closely with some of the most super stylish and swishest of bars and restaurants in town. 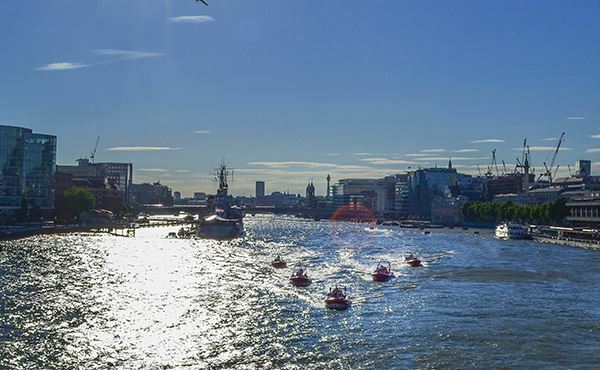 We can even pick you up and drop you off wherever you need along the river Thames ensuring your event runs on time, every time!